A tiny island in an open sea faraway from everything, such unspoiled beauty that can only be found in a truly secluded place. Indeed, God has His way of preserving His top masterpieces by placing them in remote areas. One of them is Seco Island, a distant island off-shore Tibiao, Antique. Seco Island (seco means “elbow” in the local language) is a bit far from the mainland. Not sure about the exact distance in kilometers, but sea travel is 2.5 to 3 hours according to other people who have been there. We’re amazed because ours lasted only about 1.5hrs (less than 2 hours). Also, our boat ride was “smooth and peaceful”, which is very contrary to reviews you will usually see online about the journey to the island. Some even used the word “traumatizing” in describing the journey. Second is the season. Gosh, it was monsoon season and the weather could be very unpredictable. You may never know how the ocean would behave! Third is about our boat. Our boat was one that can carry a maximum of 2 passengers only, one that could be easily swallowed by huge ocean waves. It was actually a fishing boat, and it was our first time to ride a boat as tiny as that while sailing to an open sea! Let me show you unfiltered/unedited photos of our boat ride, straight out of camera! Crystal sea. Definitely no filter/edit. Just watermark. And not only that, there’s a bonus! Aside from the very smooth boat ride, we were also greeted by some elusive mammal sea creatures called — drum roll — dolphins! They appeared while we were sailing back to the mainland. 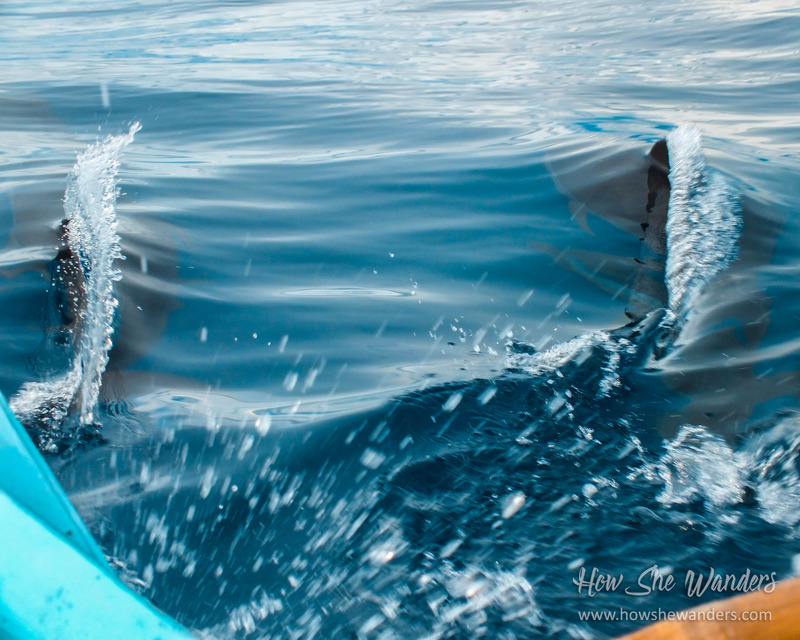 They were flipping out of the water from both sides and in front of our boat. We can even hear their cute sound, that’s how close they were from us! It was very sudden and unexpected. We were completely in awe and all we did was shout and be amazed. We did not even had the chance to take good photos of them! The only photo we got as they were jumping really fast! While we were watching them, we noticed our boat was slightly shifting its way. Our boatman said it could be dangerous because those animals are wild and we were on a very tiny boat. No matter how cute they look like, they are still wild animals. They are not like those trained dolphins in water-parks and zoos. I’m not saying they will eat us, definitely not. He said they could beat our boat as they could mistaken it as something else. We’ll never know for they are wild. Nonetheless, we still enjoyed and treasured the moment. 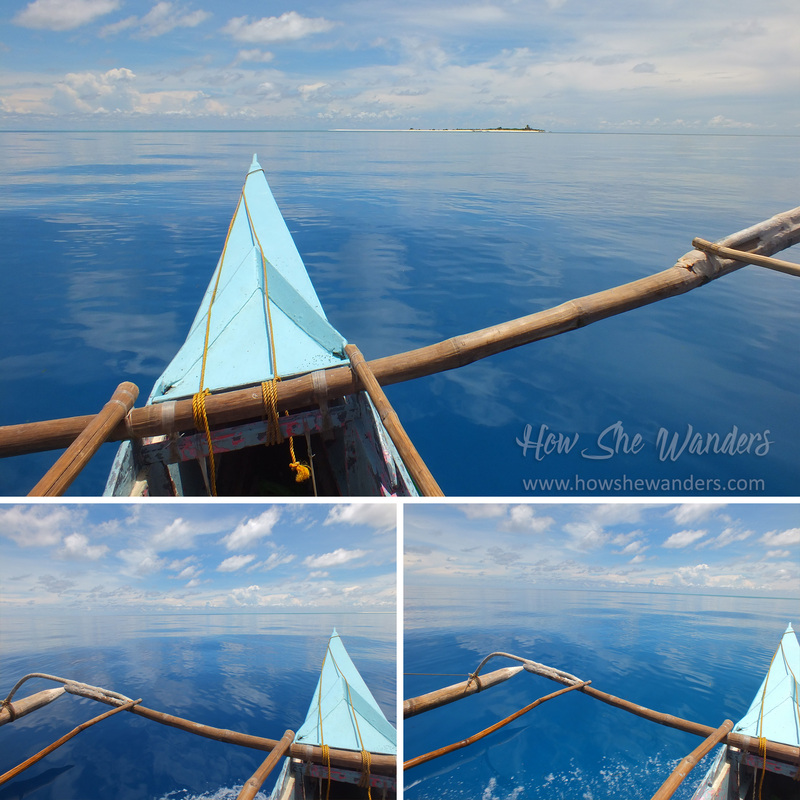 We’ve seen wild dolphins in Bohol and Kalanggaman Island, but this encounter is very different because being on a tiny boat made those dolphins come closer to us. It was off-season so it looked like we rented the whole island for few hours. There were no other visitors. I was even able to change clothes without having to hide somewhere, I just told Jeric to turn around and don’t look. That’s how secluded it was! The island is small, you can explore the whole place for just few minutes. It might be tiny but its beauty is vast! We can’t stay longer though, because there’s no comfort room and fresh water. The only facilities present here are open cottages. That’s how unspoiled and untouched it was. Mr. Sun 🌞 was happily shining his cheesy smile. The ambiance wouldn’t be so vibrant and tropic in case he chooses to hide in the clouds. Grateful that he was up all throughout the day! Yey! 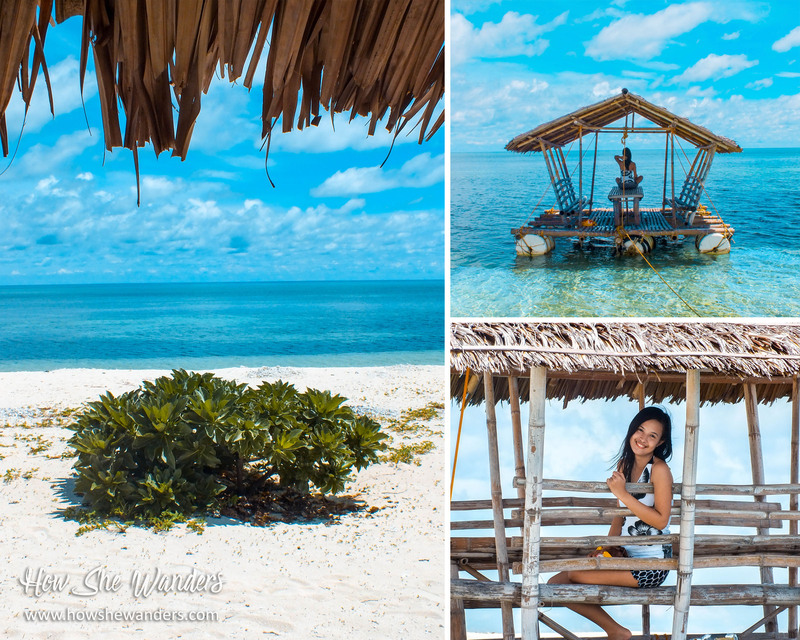 The place is perfect for beach-bumming, picture taking, and just relaxing by the shore. The fine white sands are clean and barefoot-friendly. There are also a handful of trees somewhere in the middle of the island where you could have a siesta-well-spent by setting up a tent or hammock. 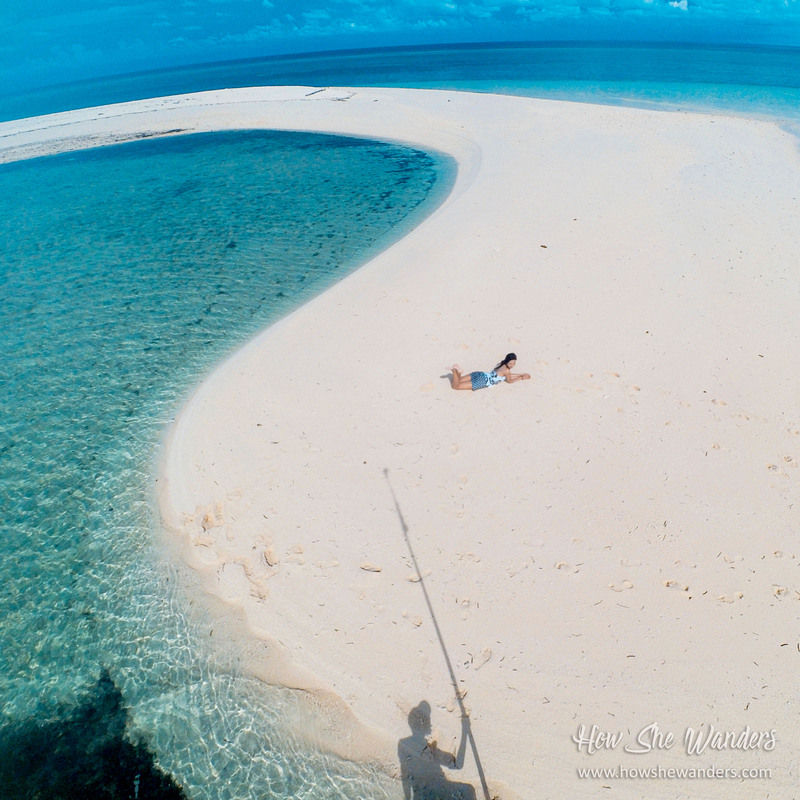 The best and most photographed part of the island is none other than the sandbar! 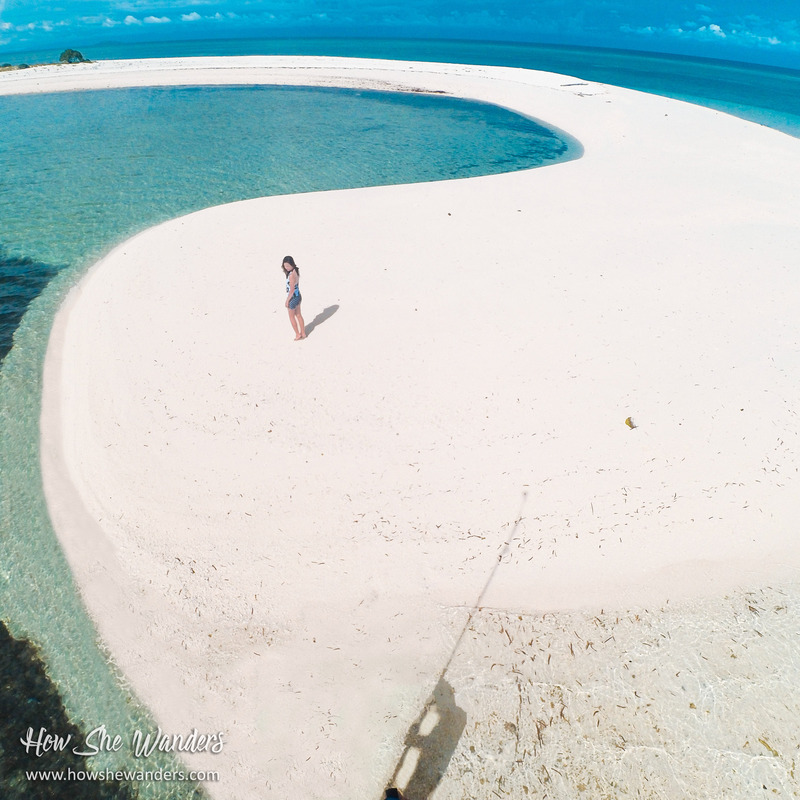 The elbow shape of the island will not be possible without the sandbar, as what you would usually see in drone shots. We don’t have a drone though, so we were not able to capture the whole shape of the island. But we had to be resourceful and creative to capture at least the shape of the sandbar. What we did was… you will see. Good thing we spotted a long bamboo pole at the beach. We just attached our action camera at one tip of the pole, connected our smartphone via WiFi, and we’re all set! The sands at the sandbar are more fine and white. One side is sea-weedy and the other side is great for swimming. Our camera wasn’t high enough to cover the whole sandbar as it is quite wide. 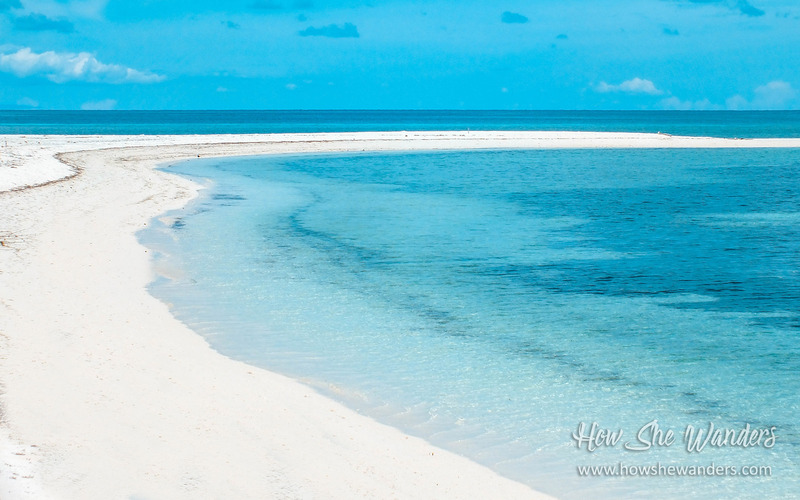 Surprisingly, the sea floor at the sandbar slopes down very gently so it’s safe to swim, unlike most sandbars that we have previously visited. 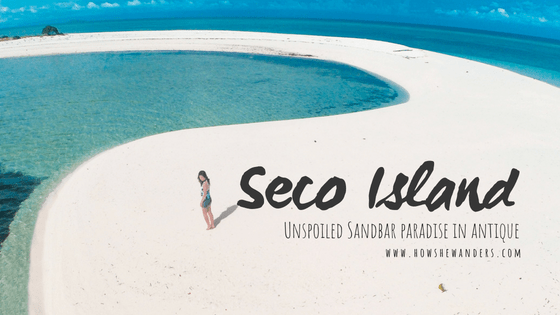 There are many other beautiful islands in the Philippines, but the remoteness and virginity of Seco island sets it apart. It’s not hard to understand why I would like to come back and relax here regardless of the distance. Our exploration in Tibiao, Antique doesn’t end here. Kawa Hot Bath, Bugtong Bato Falls, and Tibiao River were also experienced which will be discussed on my next post! Take a Bus going to Antique. There’s a Ceres Bus Terminal in Kalibo that has direct trips to Antique. Tell the driver to drop you off at Malabor, Tibiao. Ride a tricycle going to Municipal Hall. Walk to the back of Municipal Hall where boat trips to Seco Island are arranged. Wait for your boatman to fetch you. 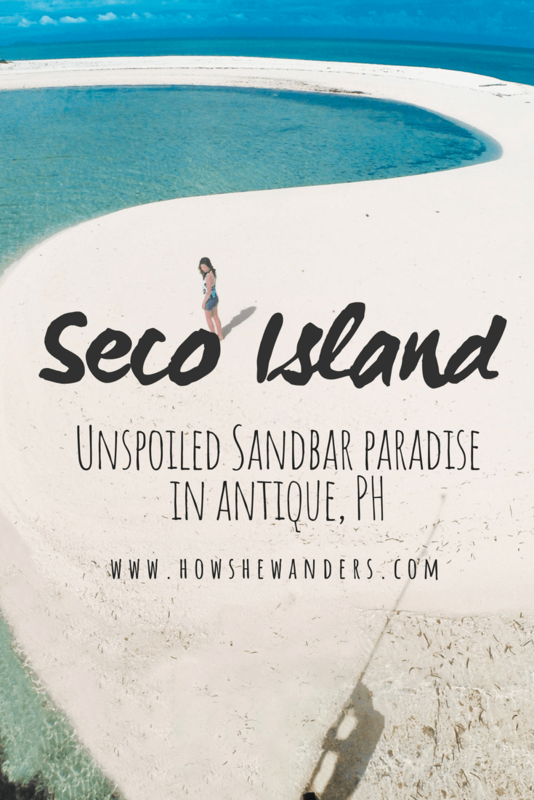 Ride a boat to Seco Island. We got our boat for 2,000 back and forth. That’s good for 2 persons therefore 1,000 each. Entrance fee to the island is 100 per person which is not included in boat rental fee. If you’re a bigger group, better get your boat from Culasi as the boats in Tibiao are smaller. Note: Before going back to the mainland, it will be better if you carry your trash with you and dispose them properly at the mainland. That little act has a great impact in preserving the beauty of the island. You might also be interested to see our full DIY itinerary, expenses, and other places we’ve visited in our 3-day Antique trip. Check out the links below!